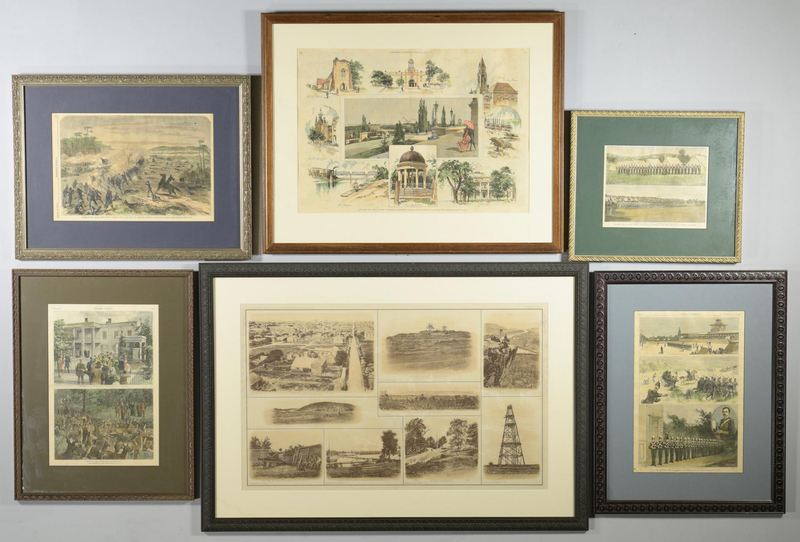 Group of Tennessee related framed prints including wood engravings from Harper's Weekly Magazine, all of Tennessee interest. 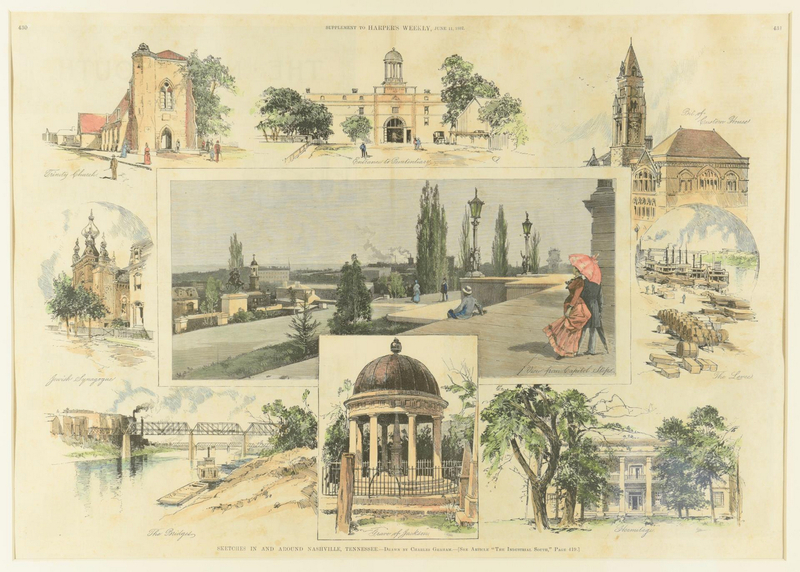 1st item: SKETCHES IN AND AROUND NASHVILLE, TENNESSEE: Drawn by Charles Graham. June 11, 1887. Showing Customs House, The Riverfront Levee, the Hermitage, Penitentiary, Trinity Church, and the Jewish Synagogue. 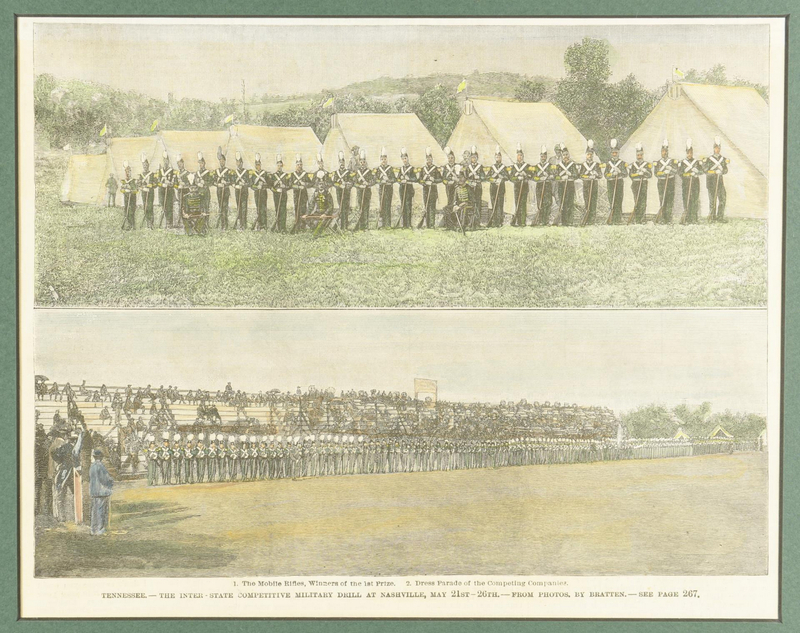 Sight – 15" H x 21-1/4" W. 2nd item: THE COMPETITIVE DRILL AT NASHVILLE, TENNESSEE – FROM SKETCHES BY HORACE BRADLEY: The Drill Ground, The Sham Battle, and The Mobile Rifles, Commanded by Price Williams. From Vol. XXVII, NO. 1381. 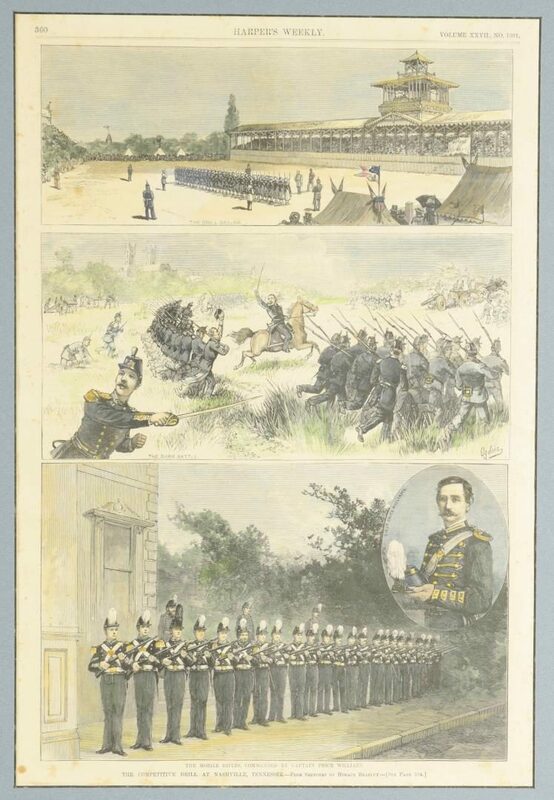 Sight – 10" H x 15" W. Framed – 22-1/2" H x 17-1/2" W. 3rd item: CHARGE OF THE THIRD BRIGADE, 1ST DIVISION, SIXTEENTH CORPS, AT THE BATTLE OF NASHVILLE, TENNESSEE, sketched by George Ellsburym. Issue date Jan. 14, 1865. Sight – 10" H x 14-3/4" W. Matted and framed – 17" H x 21-5/8" W. 4th item: Framed Julius Bien lithograph showing 8 Civil War scenes including Nashville Tenn from the Southeast showing The State Capital; Fort on St. 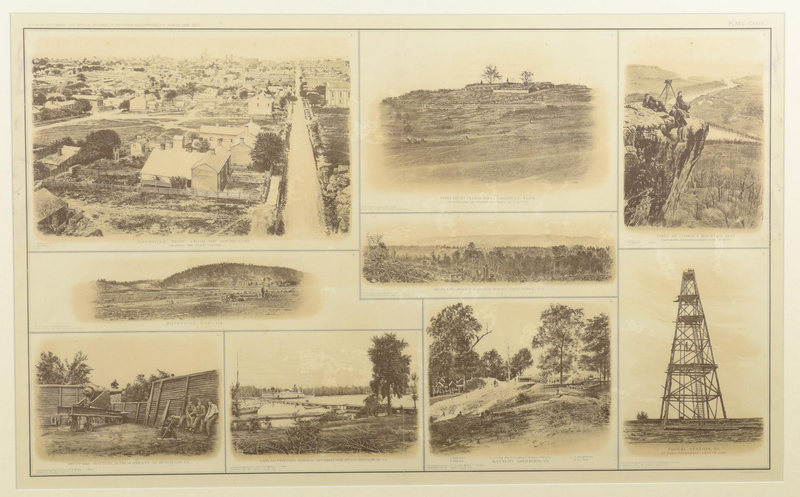 Cloud Hill in Nashville, Point of Lookout Mountain, Tenn., and sites in Georgia and Virginia (plate no. CSSIV from a Civil War related atlas). 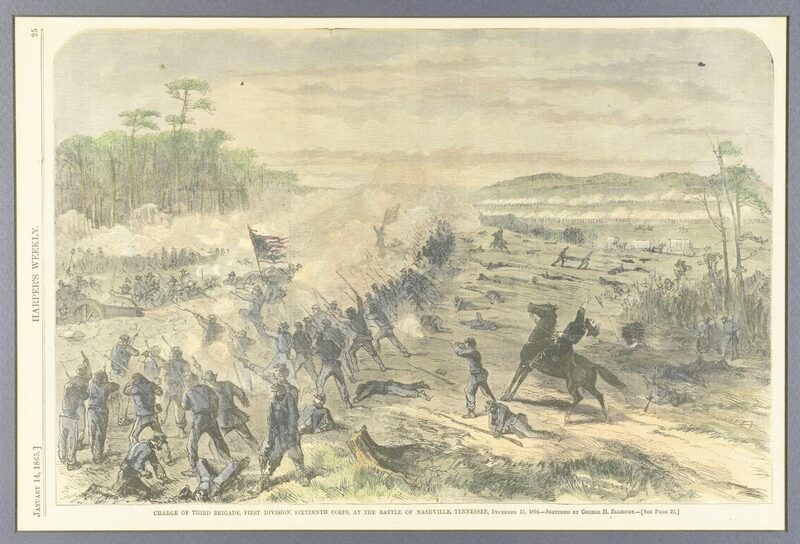 Sight – 17-1/4" H x 28-1/4" W. Matted and framed – 25" H x 36" W. 5th item: THE INTERSTATE COMPETITIVE MILITARY DRILL AT NASHVILLE, MAY 21-26TH. Shows the Mobile Rifles, Winner of 1st Prize, and Dress Parade of the Competing Companies. Image – 7-1/2" H x 9-1/2" W. Framed – 14" H x 16" W. Excellent condition. 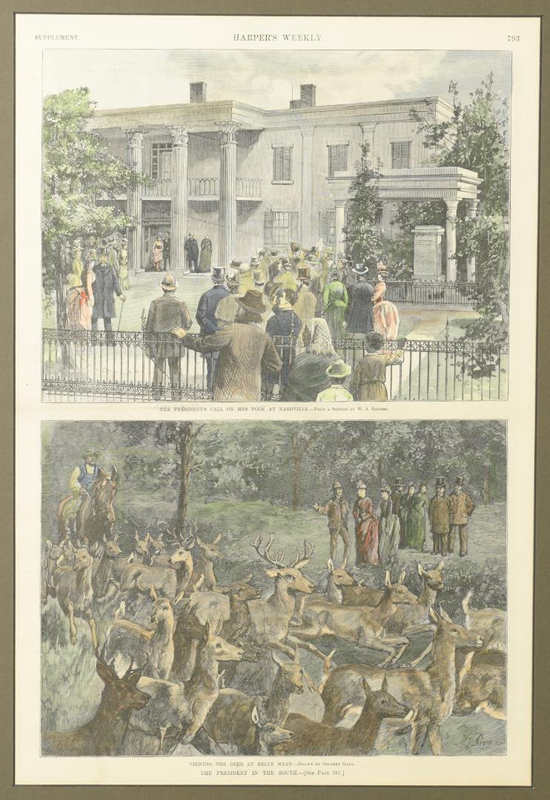 6th item: VIEWING THE DEER AT BELLE MEADE, Drawn by Gilbert Gaul, and THE PRESIDENT'S CALL ON MRS. POLK AT NASHVILLE from a sketch by W.A. Rogers. (From Harper's Weekly, undated supplement ). Image – 10" H x 15" W. Framed – 16-1/2" H x 21-1/2" W. Provenance: private Franklin, TN collection. CONDITION: All with light toning and scattered foxing but overall good or better condition. Recent matting and new frames.